Lenovo Smart Display is a fine first outing for Google’s Smart Display initiative, expanding Google Assistant immensely and granting it far more depth. That said, the visual Google Assistant could do with further development, and the speaker lacks far-field microphones. Grab this display if you’re already in the Google Home ecosystem and are dying for a visual version – otherwise, you can wait it out. 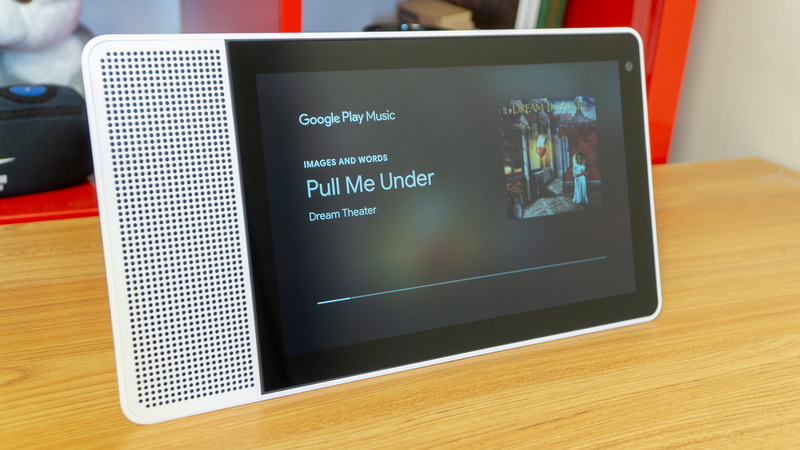 Being the first of Google’s new Smart Displays with Google Assistant, the Lenovo Smart Display has quite the impression to make. Luckily, with its sharp display and screaming audio, this smart screen kills the entrance. Now, it just needs to win the crowd with stronger features. This is the introduction to the visual Google Assistant interface that isn’t in your phone, and it’s largely a lovely one. However, Google could have went the distance when designing new versions of its apps for key Google services, but didn’t, and the whole experience suffers a bit for it. That said, the Lenovo Smart Display is an intelligently and beautifully designed smart display that takes Google Assistant to the next level with blasting audio and crisp, sharp video. Google just needs to up its game a bit more if it wants to win the smart home wars. Lenovo is selling two different versions of the Smart Display, both of which using the same processor, memory and storage. 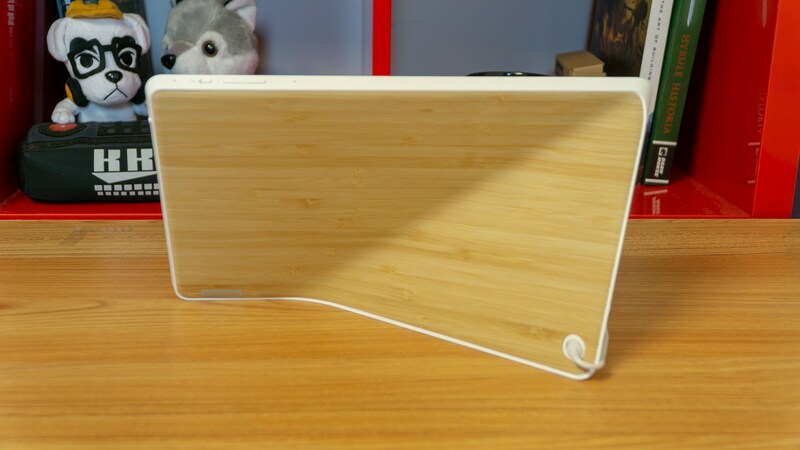 The only differences between the two are screen size and rear panel color, with the 10-inch version reviewed here for $249 (about £187, AU$333) with a bamboo-textured back panel and an 8-inch model for $199 (about £150, AU$266) with a gray plastic panel. Of course, the 8-inch model’s display is of a lower resolution, being a smaller screen, at 1,280 x 800 pixels compared to the crisp, 1200p display on the 10-inch version you see here. Comparatively, Amazon Echo Show calls for $229 (about £172, AU$306) for a device with a smaller, 7-inch touchscreen and a camera that matches the Lenovo in resolution. Otherwise, the two-screened smart speakers are on an even field. Lenovo has designed the Smart Display with visuals and audio in equal focus, hence the horizontal orientation and strange rear panel shape for a larger screen and stronger audio, respectively. The design allows for super sharp and crisp visuals as well as impressive audio performance with spoken word in addition to music and video tracks. That goofy case design has more than just sizable acoustics in mind, as the display has small rubber feet on its left side that allow it to stand in a portrait orientation. This could be fantastic for homes with limited kitchen counter or end table space. Sadly, this function is only available when making video calls using the Google Duo service. This may be a limitation of Google Assistant’s visual interface, but it’s nevertheless a sorely missed, golden opportunity to differentiate even further. We honestly would much rather use this speaker in a portrait mode than landscape for this very reason: limited counter space. At any rate, at least the Smart Display is easy to set up through the Google Home app, though you will have to reset your voice pairing that’s saved to Google Home if you want to use Duo video calling. If you already have a Google Home device, setup gets even easier, though you still need to register the device with a display code function that’s matched on your phone app. Setup gets an additional layer of intuitive design through the visual cues that the display can produce as well. Finally, privacy also appears to be among the top of Lenovo’s design priorities, with hardware shut-off buttons for the microphone and camera that correspond with software-level prompts. While we admittedly don’t get a ton of use out of our Google Home speaker in the kitchen, the display adds an entirely deeper element to the experience. Being able to see the recipe that Google Assistant is guiding you through in plain text, tapping the next step so as not to interrupt your favorite song is an awfully niche benefit but is kind of a big deal when talking to Google Assistant just gets tiresome. What’s great about Google’s approach to the visual Google Assistant design is that it allows you to enter commands via touch prompts for almost everything you could ask it to do with a ‘Hey, Google?” Being able to just touch on the thing you want Google Assistant to do without conjuring the magic string of words is a welcome improvement. That said, going deeper than activating that function with a tap generally requires your voice to finish out the task. 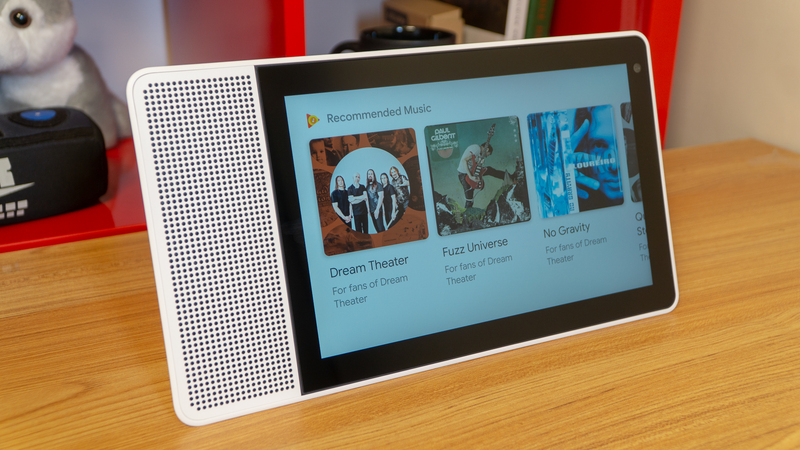 There is no keyboard function on the Lenovo Smart Display that we could find, which would be helpful when trying to enter voice commands the speaker can’t seem to understand. 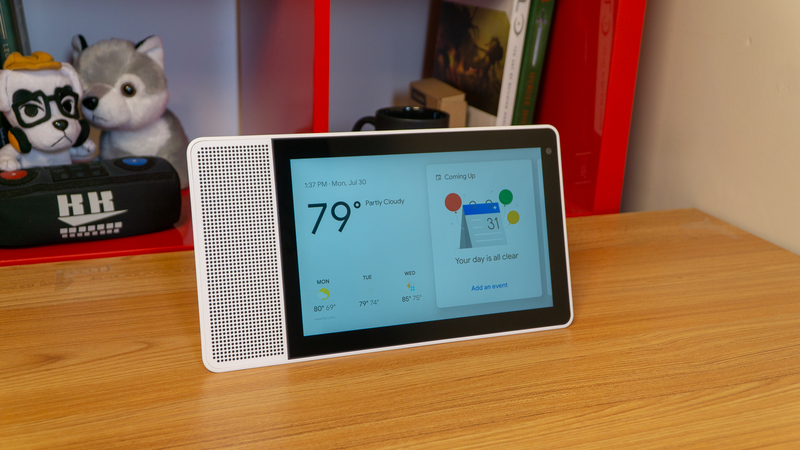 Similar to Echo Show, the Google Assistant visual interface is largely card based, with several functions tied to cards that, when tapped, expand to reveal their full functionality. For instance, tapping the ‘Coming Up’ card opens up the function for your calendar. If you’d like to add an event, the screen tells you which command to say after the call phrase. The card system does a good job of inviting you to use the Smart Display for different things. At different times of day, a card simply known as ‘For Your [insert time of day here]’ appears toward the end of the available cards if swiping left, suggesting tasks that are most fitting to the time. Just like with Google Home, you can also create routines for Google Assistant to follow with certain commands. For example, you can set it up so that by saying “good morning” to the display that it turns on your smart air conditioner or smart light bulbs, turns on the smart coffee maker to brew and gets your run of morning news briefs going. Navigating the interface via touch is largely self explanatory. Swiping in from the left side of the display sends you back to the previous screen, and swiping up from the bottom conjures a settings screen. You can also use commands like, “Hey, Google: go home,” to get to the home screen. Finally, the display makes wonderful use of its gorgeous, sharp visuals and wide viewing angles with several photo gallery modes for when it’s idle, including your own photos and professional artwork and photography. Because of the display, we find Google Assistant to be genuinely more useful and versatile. Frankly, this is the ultimate kitchen TV if there ever was one in our house. The introduction of Google Duo voice and video calling to Google Assistant is huge for the platform. However, it is a little of a bear to set up, requiring you to reset your voice profile with the service and give up your phone’s contacts. 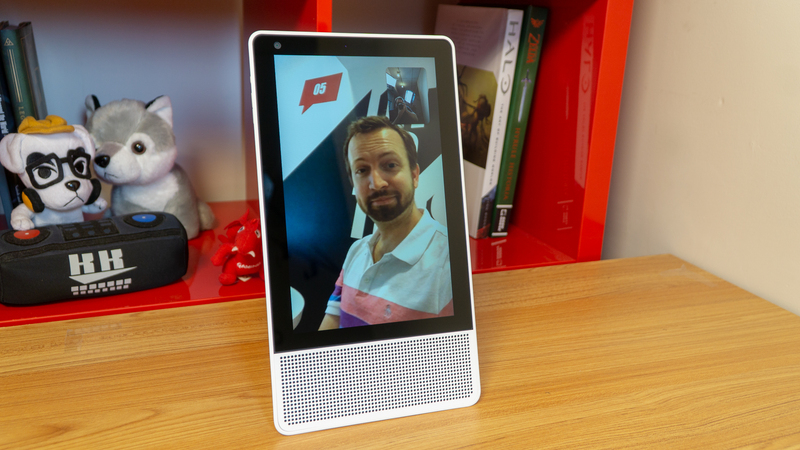 Then, of course, the video portion of this feature only works when calling those with Google Duo installed on their phones or tablets – or other Google Smart Displays. Luckily, voice calling works with any old phone number, cell or landline, and sounded fantastic in our testing, with excellent separation between microphone and speaker audio. Video looks colorful and sharp on the Smart Display, thanks to the FHD+ display and 5-megapixel camera. Naturally, a lot of the call quality depends upon the connection strength of whomever is on the other end, considering they’ll more often than not be on LTE compared to your Wi-Fi. So long as you’re able to convince your friends and family to install Google Duo, this is an excellent feature. However, getting everyone in your life to use the same app as you for video calling – that isn’t Apple’s FaceTime – is a herculean task. By that point, you may as well just FaceTime to show your mother-in-law your son’s new outfit she sent to you … unsolicited. Music and video are probably the Lenovo Smart Display’s strongest suits, given that it was expressly designed to emphasize these functions. The oversized display makes for excellent video viewing, even from strange angles, and the speakers are powered by large drivers with plenty of breathing room for full, deep and crazy loud (like, Google Home Max loud) sound. Google Play Music integration is a little rudimentary, simply offering to play your playlists or whatever you come up with. The full-screen player doesn’t display anything more than the card on the home screen, which is a missed opportunity. We should be able to swipe through the queue or read lyrics using this awesome display, but alas. YouTube integration isn’t much better, offering simply ‘Recommended’ videos based on what you’ve watched in the past with your linked Google account and your subscriptions. There is no ability to thumb through YouTube for a specific video, and it’s much harder to get to a specific video through voice command than it is a song. This may (and should) improve as Google Assistant’s interface gets updated, but this certainly isn’t a great first look. Sure, the display and speakers make video and music on the Lenovo Smart Display fantastic and more useful in their own right, more could be done here. We don’t need the full-fat Google Play Music or YouTube experiences, but something closer and more tailor made for screen-based Google Assistant speakers is necessary. The virtual assistant by Google works pretty excellently here. The device’s microphones are dual array, which works well enough, but they’re not far-field mics. That’s an unfortunate oversight, as even around the corner of a shallow wall blocks the speaker from hearing our voice. Comparatively, Google Home can hear us from other rooms entirely in the house, and Amazon Echo Show, too, uses far-field mics. Otherwise, the voice-controlled facet of Google Assistant is faithfully replicated here to wonderful effect. However, admittedly the visual portion of the service needs a little more time in the oven. Simply put, we need more touch interaction with the Google Play Music, YouTube and Google News portions of the interface. If the interface can conjure a locked-down web browser window to explain what a giraffe is with Wikipedia, it should allow me to swipe through my favorite Google Play Music playlists and YouTube subscriptions. Beyond this oversight, Google Assistant is fantastic. The service remains the most versatile and advanced digital assistant out there, making incredible use of Google’s massive repositories of data to seem more intelligent than any other. 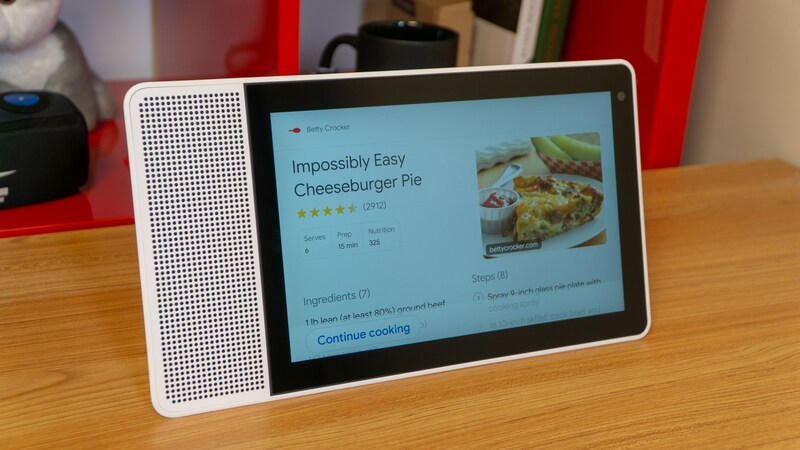 For instance, when asking Google Assistant on the Lenovo Smart Display what a narwhal is, the visual interface surfaced what it thinks are similar questions to explore as tappable icons. They were all about unicorns. That should alone explain how much more advanced Google Assistant is against its rivals. 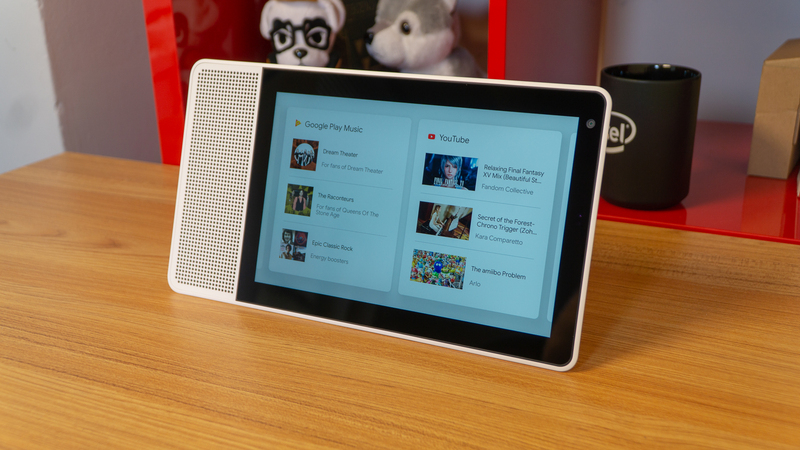 The Lenovo Smart Display is the first out of the gate with the new visually-focused Google Assistant, and it’s largely a winner. This is a smart speaker that we’d much rather have in our kitchen than the now run-of-the-mill Google Home speaker. Bringing a visual element to the service really blows the functionality and capability of such a device wide open. However, Google appears to have rested on its laurels a bit in the interface design department, issuing versions of Google News, Google Play Music and YouTube that are largely half-baked and software that features no portrait orientation. Also, while Google Duo calling is a fantastic feature that works well, it asks a helluva lot of your friends and family. Luckily, these are problems that can be amended with software updates, which we’re sure are in the works – if not, they really should be. As for Lenovo’s product design here, it’s a brilliant shell for the Google Assistant inside, with a smart focus on audio and display quality that shines through in every way. With that, unless you’re deep into Amazon’s ecosystem, the Lenovo Smart Display is a more versatile, advanced smart screen that will only get better over time. It might be more expensive on the whole, but the Lenovo Smart Display gets more for your buck than the Echo Show – even with an interface that’s already due for a few updates.